Today you get both Day 18 and Day 19 of the Advent Calendar - sorry for the delay. Day 18 brings you another Pattern Set. 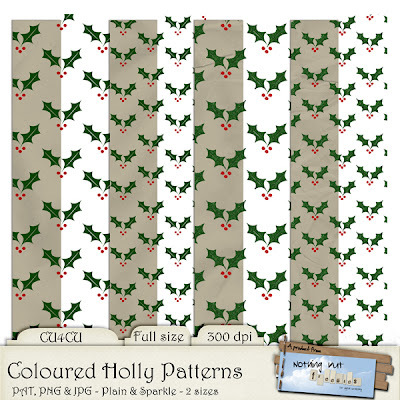 This time it's Holly, and you get them as PAT file for PS/PSE (transparent), PNG transparent overlays and PNG papers with brown background. 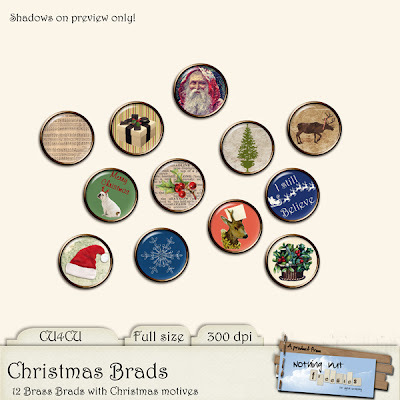 And today's freebie (Day 19) is a little collection of Christmas Brads. Brass ring with vintage-ish Christmas motives. 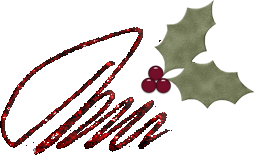 Enjoy and stay in your best Christmas Spirit until we meet again - tomorrow? the papers and brads are fantastic! thank you so much! Many thanks for todays lovelies! The little reindeer brad is adorable! Thank you very much. Merry Christmas!
! * ( /\ ) *!
! . . / \ . . ! !/ /_ ..._ \ \! Both freebies are awesome...Thank You!! Pretty images and paper. Thanks for sharing!